Mildred Edwards Fillmore, affectionately known by many as “Ma Fillmore”, was born to Martin and Julia Mitchell Edwards on October 21, 1927 in Fort Valley, Georgia. She was the fourth of eight siblings of which four of her siblings preceded her in death; A. J. Edwards, Eloise Edwards Stinson, Claybon J. Edwards and Vivian M. Edwards (an infant). Mildred graduated high school then received a diploma from Dermis Cura College of Beauty Culture in Atlanta, Georgia. She attended Fort Valley State College where her skills as a hairdresser were well known at the college and to the women of the community. Mildred accepted Christ at an early age and joined Trinity Baptist Church where she was a member until she moved to Chicago, IL as a young adult. Shortly after arriving in Chicago, Mildred was approached by one of the finer department stores and asked if she would model for their store. She worked and modeled there for several years. In 1956, Mildred married Warren Fillmore. They had three lovely daughters Sharon, Angela and Cynthia. They joined Antioch M.B. Church under Rev. Wilbur Daniels where their daughters were baptized. They soon moved their membership and joined St. Stephen A.M.E. Church under the pastorage of Rev. Wilfred Reid and Rev. Albert D. Tyson, III. 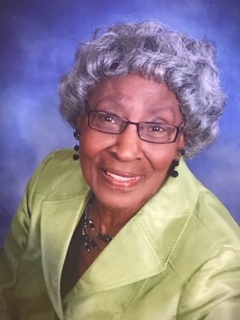 Mildred served as member of the Gospel Choir, church class leader, Sunday school teacher and was appointed as a Stewardess and served in that capacity until moving to Greensboro, NC in 2007. Mildred loved the Lord! She lived a strong prayer life. She knew that prayer changes things. She prayed for others, with others and encouraged other to learn to pray. Mildred’s love of God was evident in her spirit and her smile. Her inner and outer beauty was so radiant and undeniable. It was HEAVEN sent. Mildred had a love for self-care and beauty. She began a career as an Avon Representative and shortly thereafter, she was promoted to District Manager with a staff of over 200 hundred women. In 1985, Mildred retired and enjoyed being at home with her husband Warren, who was also retired. After his death in 1986, Mildred worked part-time at the Environmental Protection Agency. In 1992, she became a grandmother to Jabari K. and retired again to assist in the care of her grandson. Three years later, she was blessed with another grandson Anthony J. and continued to be a doting grandmother! Family was her passion. Mildred always made holidays special for her family. Friends without family became part of her small family. Easter and Christmas were her favorites. She colored Easter eggs and decorated the Christmas tree until her later years. Mildred really enjoyed good food! In 2013, Mildred returned to Chicago and soon moved in with her daughter Cynthia. She joined Third Baptist Church in October of 2013 and attended regularly until her health began to decline. After a period of illness, on Wednesday, April 3, 2019, the Lord called her home to be with Him and said, “Well done thy good and faithful servant”. Mildred leaves to cherish her loving memory three daughters: Sharon Denise Williams of Chicago, IL, Angela M. Jones (Leonard) of Bellingham, WA and Cynthia Brown of Chicago, IL., two grandsons, Jabari K. Beckley and Anthony J. Beckley both of Chicago, IL, three sisters; Mary J. Marshall of Fort Valley, GA, Rosa L. Washington of Las Vegas, NV and Hazel Edwards of Chicago, IL, a sister-in-law Mary Edwards, Fort Valley, GA, a “special” daughter Phyllis Taylor of Oak Park, IL and “special” granddaughter Nia Smith of Atlanta, GA, a goddaughter Rachelle Redding of Chicago, IL; a very devoted Caregiver, Deborah Jones of Chicago, IL. A host of nieces, nephews, other relatives and friends.